There are two major factors that will affect the number of dental implants one will need for denture. First, the density and the condition of the jawbone will have an effect on the quantity of implants that our dental surgeons will place in the jaw. The second factor that will influence the quantity of dental implants is whether one wishes to have a conventional acrylic denture or use an all porcelain denture instead. 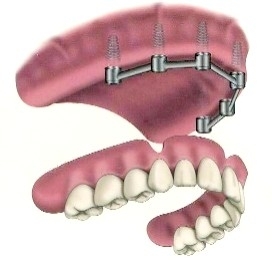 The porcelain fixed bridge is an alternative to the acrylic denture. It is more expensive because of larger number of implants required, as well as the material used in and higher number of hours required for fabrication of this type of denture. Esthetically, however, the porcelain bridge looks more natural. Moreover, this type of dentures is also more comfortable than the acrylic one. While our Acrylic Denture Packages with our dentists in Costa Rica start at $11,999, MedVacation’s all inclusive denture package for porcelain bridge is priced at around $16,000. A comparable porcelain denture in the United States will cost over $30,000. The cost of All on 4 upper or bottom denture package is $11,999. 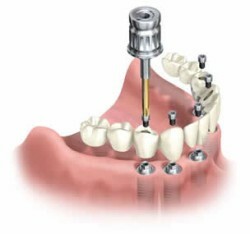 The patient may need only two or three dental implants for denture, if the jawbone is in a good condition. If you are considering dental implants dentures, you should be aware of several types of materials available to you for your denture teeth. The traditional dentures have been made out of acrylic. The porcelain fixed bridge is an alternative to the acrylic denture. Porcelain teeth dentures are more expensive than dentures made entirely out of acrylic. However, esthetically, the porcelain teeth denture looks more natural. More importantly, it is also more comfortable than the acrylic option.